Earlier this week, Miami International Airport shared a very short sample of the longer reels of film clips now showing on old-style flight display monitors in Concourse F at the airport. The reels were put together by the Lynn and Louis Wolfson II Florida Moving Image Archives at Miami Dade College and the reel filled with celebrities arriving at MIA from the 1950s through the 1980s is especially fun to watch. Looks for Frank Sinatra and Ava Gardner, Liberace, Ed Sullivan, Susan Hayward, The Beatles, Bob Hope, Jane Mansfield, Eleanor Roosevelt, Spiderman, Sylvester Stallone, and Elizabeth Taylor, among others. 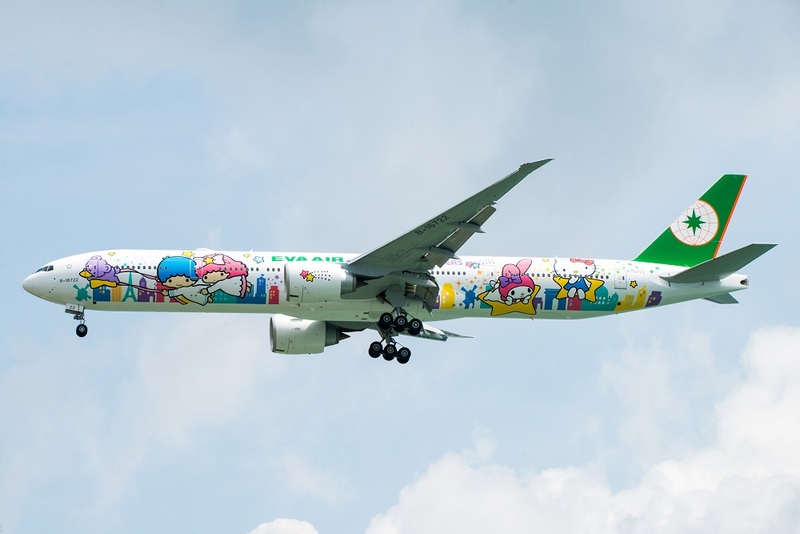 With a great deal of fanfare and classic Hello Kitty cuteness, EVA Air’s brand-new, specially painted Boeing 777-300ER landed at Houston’s Bush Intercontinental Airport on Friday, June 19, 2015, with the carrier’s Chairman KW Chang serving as captain. Named the Hello Kitty Shining Star Jet, the plane’s livery features Little Twin Stars Kiki and Lala, Hello Kitty and My Melody and is EVA Air’s seventh specially painted aircraft and its second using a long-range Boeing 777-300ER. The plane will fly on EVA Air’s new route between Houston’s George Bush Intercontinental and Taipei’s Taoyuan International Airport three times a week. A fourth flight, using a Boeing 777-300ER with standard EVA livery, will be added on July 8, 2015. Here are a few pictures from the arrival event at IAH Airport. More pictures of the Hello Kitty-themed items on board – and available for purchase on board the airplane – tomorrow on Souvenir Sunday. You have a week – till Saturday, April 26 – to log onto the BBC website and listen to this hour-long documentary about the history of Ireland’s Shannon Airport . Shannon Airport was the first airport in the world to have a duty free shop and the bar there claims to have invented the now-iconic Irish Coffee drink. And, as the accompanying photo gallery shows, the airport has had its share of celebrity visitors, including Marilyn Monroe, Bing Crosby, Fidel Castro and Gene Kelly. Gene Kelly shopping in the Shannon Airport duty free shop; courtesy Shannon Airport Authority.